Using satellite photos, UPenn professor Rachel Weinberger created an estimate of how much off-street parking existed citywide, which she then used to show the relationship between parking minimums and car commuting. Evidence continues to mount that New York City’s mandatory parking minimums encourage people to drive. New research from University of Pennsylvania planning professor Rachel Weinberger, set to be published in an upcoming issue of the journal Transport Policy, shows once again that providing guaranteed off-street parking spaces makes New Yorkers more likely to drive to work. By mandating the construction of parking with new development, the city is encouraging more cars to drive on the city’s already clogged roads. With the Department of City Planning now considering changes to parking minimums in the “inner ring” of neighborhoods close to the Manhattan core, Weinberger’s research is especially timely. DCP has been loath to acknowledge that mandating the construction of parking induces driving. This data bolsters the argument that eliminating parking minimums will help the city reduce traffic and achieve its sustainability goals. Weinberger’s article (hat tip to Atlantic Cities’ Eric Jaffe) builds on research she conducted with John Kaehny for Transportation Alternatives, particularly the 2008 report “Guaranteed Parking, Guaranteed Driving” [PDF]. That piece was the first to show that off-street parking spaces attached to residences, the kind that parking minimums require, encourage people to drive to work. Weinberger’s new research expands that work to all of Brooklyn, the Bronx and Queens (in Manhattan parking is so much harder, and in Staten Island it’s so much easier, that it’s hard to make a sound comparison). “Instead of focusing on the two case study neighborhoods, it’s a rigorous statistical analysis of the much broader city,” Weinberger told Streetsblog. 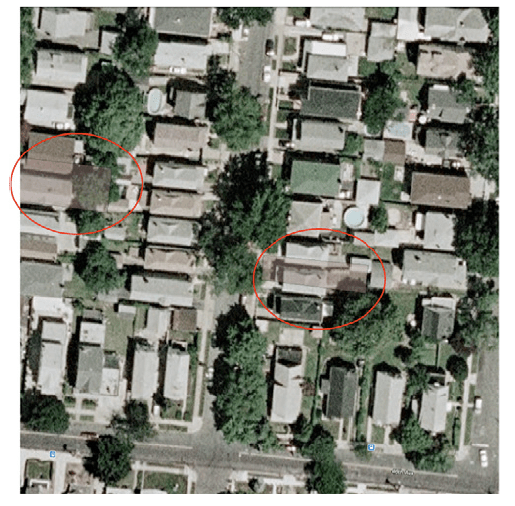 To develop the data set for her calculations, Weinberger drew on DCP data for large developments and a combination of satellite imagery and site visits for smaller buildings. Weinberger then compared the availability of off-street parking to Census data showing how people get to work. To isolate the effect of having a parking space at home, she looked only at commuters heading to the Manhattan core; on the destination side, parking was always scarce and transit always convenient. DCP’s study, however, did not even measure the supply of off-street parking attached to residences, nor did it control for those demographic factors to isolate the effect of parking maximums; Weinberger’s new research, in contrast, does both. I don’t want to say where DCP must keep its head, but let’s just say this is a city agency that must have one big shampoo budget. I’d love to know how much of this is driven by stupidity and how much is driven by contempt for people living in cities. I wonder what could be done at the federal level here. The EPA laws and regulations that gave us the Manhattan core parking maximums must not be so toothless as to forbid any progress regarding non-attainment areas. Parking: If You Build it They Will Come… in Their Cars.